LA Innovation Week 2015 (#LAIW2015) took place in October 2015. Here is a snapshot recap of the event. Over 160 events were hosted during LA InnovationWeek! Click here to visit the LAIW2015 website. Building on 2014 inaugural year success -Recap from 2014: What was the inaugural InnovationWeek like? 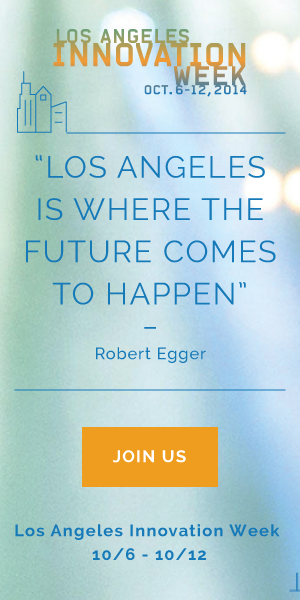 The inaugural Los Angeles Innovation Week (LAIW 2014) took place from October 6th-12th , 2014. The Goal of Los Angeles Innovation Week was to highlight all of the amazing, creative and innovative and entrepreneurial things happening all over our region. Although the LA Center of Innovation at LAEDC initiated and organized the concept, it was the many partners throughout LA County who made LA Innovation Week truly incredible! Mayor Garcetti helped to kick off the week at an event unveiling the first ever Tech Sector Economic Impact Report for the region, authored by LAEDC. 38 events took place during the week and over 140,000 social media impressions were gained. Over 6,000 people attended events for LAIW (not including CicLAvia in which over 100,000 people typically attend). City of LA Mayor Eric Garcetti and Bill Allen, president of LAEDC speak at the kickoff event for LA Innovation Week, where the report “High Tech in LA” was released. Events ranged in sectors: Bio/Cleantech, Alternative Transportation, Digital Technology, STEAM/STEM Education, Makers & Civic Innovation. During the week, the City of West Hollywood kicked off their first Innovation and Technology Task Force called WeHoX. This task force will be an ongoing advisory group for West Hollywood in matters of civic innovation. Through LAIW, the LAEDC and innovateLA created many partnerships (over 75) with organizations and companies in the region who are dedicated to supporting and growing the innovation ecosystem in Los Angeles. President Obama made a surprise visit to Los Angeles during the week and chose Cross Campus, a technology co-working space, to make his remarks and hold a town hall. At least 15 events that were part of Innovation Week were already happening during that week—this is important because it signals that the ecosystem is robust and that there are easily double to triple that many events happening every week in our community. The Australian Consulate teamed up with businesses and organizations from Australia, who have located their businesses here, to showcase and celebrate their contributions to our ecosystem. Movember (a global organization dedicated to Men’s Health awareness), Virgin Australia, Vittoria Coffee and others were involved. USC and UCLA both held multiple events for Innovation Week. For more information, contact the Director at LAEDC’s Center of Innovation, Chris Rico. LAEDC Executive Committee Member Turkish Airlines: Female GM is one of the reasons for soaring success in L.A.